The Ness M1 offers unequalled value to System Integrators, Installers and end users alike. Unlike panels that may be strong in automation but weak in security (or vice versa), the M1 boasts a rock solid security foundation with the most imaginative and powerful automation functionality available. Integrators and Installers will value the flash memory firmware, RS-232 serial port, ethernet connectivity option, fast PC programming, and ease of installation. End users will welcome the quality and futuristic capabilities of the versatile keypad, voice telephone dialler and the built-in telephone remote. The 500+ word vocabulary pleasantly announces system status, configurable in any sequence to alleviate user intimidation. M1 offers the flexibility to integrate industry standard systems and components for easy upgrades and system expansion. In addition to the powerful digital dialler, the M1 has a builtin voice dialler, which can call any phone, on or off site, including a mobile phone. Remote telephone control capability allows you to perform tasks such as; change the temperature setting, control the water heater, lower the garage door, set lighting scenes, arm/disarm the system, control sprinklers, and more by simply picking up the phone – any phone. M1 can be expanded up to 208 inputs using up to 12 add-on Input Expanders. Each input can be programmed to be Normally Open, Normally Closed, End Of Line, High Security 4 State End Of Line or Analogue to suit a huge variety of detection and sensing devices such as motion sensors, mechanical contacts, fluid level sensors, gas sensors, smoke detectors, temperature sensors and many more. Up to 12 Input Expanders, each with 16 zones can be added anywhere along the 4 wire data bus. The high end security features include multiple user codes, multiple area operation and multiple arming levels such as Away, Stay, Stay Instant, Night, Night Instant, Holiday mode and other combinations. The onboard telephone dialler is capable of reporting alarm events to a central monitoring station and/or several private telephone numbers such as mobile phones. The Ness-M1, together with the Ness-RP Automation Programming software offers powerful, easy to setup and manage, life style enhancement features. The automation programming allows mixing and matching of lighting components, outputs(relays or voltage), thermostats, temperature sensors, and all the security inputs and features to integrate functions that add value and appeal to the owner/user/manager. Whenever/And/Then rules can be set to turn on and off Powerful Automation in response to a time or day, a certain sensor, or the arm/disarm status of the system. Outputs can be set to control door strikes, irrigation sprinklers, circulating pumps, valves, outdoor signage, refrigeration etc. Automation tasks can also be driven by the built-in astronomic clock which calculates sunset/sunrise depending on your geographic location and also takes daylight savings into account. You dream it, M1 does it! The Ness M1 can also be interface with the Ness IDTeck suite of powerful access control systems - this combination offers high security, flexibility and reliability at a competitive price. The range includes everything from standalone single door controllers to networked systems up to 100,000 doors. Included is a full line-up of elegant and compact RFID proximity readers, long range readers for vehicle access and/or hands free applications and smartcard readers. The standard range includes high security Biometric readers, combination of RF/PIN plus fingerprints or face recognition to secure and control access to any premises. Several powerful but simple to use application software suites provide total solutions for Time & Attendance, Site Management, Lift Control and centralised user management. Large zone capacity: 16 on-board, expandable to 208. RS-232 serial port interface to computers and other devices. 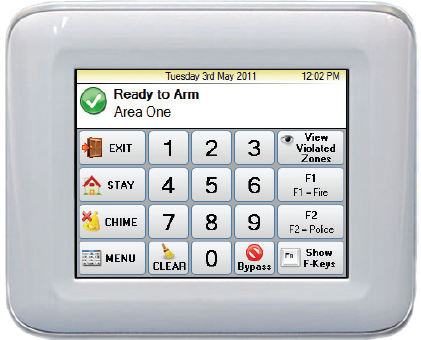 Menu driven keypad programming - no manual required!. 13 On-Board Outputs: 1 voice driver/siren, 1 siren driver/voltage, 1 relay, and 10 low current (50 mA). Includes fire alarm verification outline. 99 User Codes (4 or 6 digit) with assignable authorities. Arm levels: Away, Stay, Stay Instant, Night, Night Instant, Holiday. True V.22 bis modem for fast reliable upload/download. Integrated Voice dialler uses vocabulary or custom word/phrases. Digital Dialler: SIA, Contact ID, 4 + 2, and Pager. Installer telephone (buttset) test feature. Create lifestyle enhancing comfort, convenience, and security. Rules utilise easy to understand text based references. Control lighting using RS-232 serial or 2-way Power Line Control (PLC) ports for On, Off, Dim, All On, All Off commands. Sunset/Sunrise calculation and activation / onboard astronomic clock. Transmit and receive custom serial ASCII strings. Read Temperature Sensors and communicate with Thermostats. Turn on Tasks, Lights, Outputs via Keypad or Telephone Remote. Networks with a broad range of other systems Power Supply. Heavy duty - 2.5 Amp power supply w/ 1.5 Amp continuous. Master power switch and Low battery disconnect. PTC (fuseless) resettable overload protection. • Displays system diagnostics and settings.